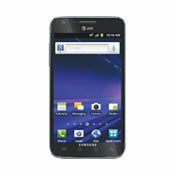 As the name would suggest, this phone comes under the Galaxy S II line of popular smartphones. This is not AT&T’s standard version of the Galaxy S II which was released previously, but is more like the Galaxy S II on steroids. The Skyrocket is the updated version that comes with LTE capabilities and is set to compete with the Epic 4G Touch by Sprint and DROID Bionic by Verizon. It is one of the first two phones released for the recently launched AT&T 4G LTE network, which alone is a great reason to buy the Samsung Skyrocket. Looking at the design of the Samsung Skyrocket will give you déjà vu. We are big fans of the original Galaxy S II devices and as such we were glad that Samsung did not do much tampering on the external features. While many have complained about the use of plastic, personally we like it as the phone is a lot more durable than its HTC and Motorola counterparts which are subject to chips and scratches when the phone is accidentally dropped. On the inside, the phone does live up to its Skyrocket moniker. Powering the Samsung Skyrocket is a 1.5GHz dual-core chip from Samsung as well as dedicated GPU. As if that wasn’t enough, there is the usual 1GB of RAM as well as 16GB of on board memory, and since you can never have too much memory, you are welcomed to expand said memory by up to 32GB thanks to a microSD slot. The screen is bigger than the other Galaxy S II device sitting on the AT&T network. With a 4.5-inch screen, one that boasts 480 x 800 pixels with Super AMOLED Plus technology, this screen is bright and vibrant to say the least. On the rear of the SGSIIS is an 8 megapixel camera, one that sports 1080p video capture at 30fps as well as a 2 megapixel front facing camera. Moving along, we find quadband GSM, triband UMTS and monoband LTE with support for HSDPA+, UMTS and HSUPA data. A-GPS is included along with Bluetooth 3.0, 802.11b/g/n/a Wi-Fi, USB 2.0, NFC and DLNA as well as microUSB for syncing. Android Gingerbread 2.3 is the operating system of choice. Since its inception earlier this year, the Galaxy S II has been the de facto king of the Android realm and not much has changed since then as the phone still runs circles around the competition. With the Samsung Skyrocket those numbers still stand true. In most of our all our tests, the Samsung Skyrocket performed well posting high numbers in 3D games, videos, browsing and Flash content playback. When it came time to taking pictures and recording videos, we were once again pleased with the results we received from the 8 megapixel camera. Every once in a while we noticed slight oversaturation, but nothing too noticeable. Video recording was great as well with antialiasing only occurring on fast moving subjects. The front facing 2 megapixel camera won’t do much justice for picture capturing, but it serves as a nice webcam. The screen is marvelous as well. This is the exact same panel we saw on the previous Galaxy S II and it is still as impressive. Overall, we had little problems with oversaturation, and the viewing angles are some of the best we have ever seen on a mobile device. Battery life is another strong point. Whatever Samsung did to maximize battery life worked wonders as we can easily pull a day’s charge out of the Samsung Skyrocket. With Wi-Fi and LTE off, numbers are even better and on a standard battery run down test we pulled in well over 6 hours of continual video playback. These numbers are much better than what we have seen on Verizon LTE phones. The Samsung Skyrocket is an amazing device that even exceeds the performance of the base Galaxy S II model, driving consumers who can come up with the cash to find out where to buy the Samsung Galaxy S II Skyrocket at the best price. Is the Samsung Galaxy S II Skyrocket the phone for you? That will ultimately depend on your definition of the ‘right Smartphone experience’. With a 4.5-inch screen, it is not the phone for everyone, but if you can somehow manage to find a place in your pocket for the Skyrocket, you will not be disappointed with its performance and it easily ranks among our top five Android devices. If only AT&T’s LTE network was as large as the phone, however their LTE coverage is promised to grow quickly.